Happy Kitchen Sink Stamps Monday, thanks for stopping by! 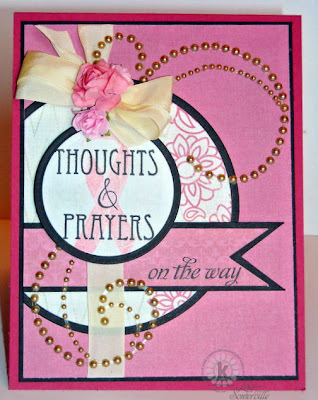 With October being Breast Cancer Awareness Month, I wanted to start out the month with a "pink" card. Inspired by this weeks Mojo Monday Sketch, I used the Multi Step Ribbons with a Cause set. All pattern papers are from My Minds Eye. Thoughts and Prayers were stamped in Black on the smaller circle, then I added the Ribbon in Pink. To embellish I added some Zva Creative Pink Roses/Crystal Flourishes (CRB-05CB-123) and some Vintage Ivory Seam Binding tied into a Double Bow. How cute is that!? Gorgeous weathered Christmas colours! Congrats! Please contact Adela with your template choice! Beautiful caring card for the month of October! So beautiful, Lisa!! I love the roses and swirls of bling!! great use of the pearls, this is gorgeous! Lisa, this is just perfect for October! Love the design, so pretty! Happy October! OH! WOW! That multistep stamping is COOL... I haven't ever used/seen Kitchen Sink Stamps so I had NO idea they had three steps to stamping them.... What a GREAT look!!!! Beautiful! Love the pretty pinks you used for this wonderful supportive card.